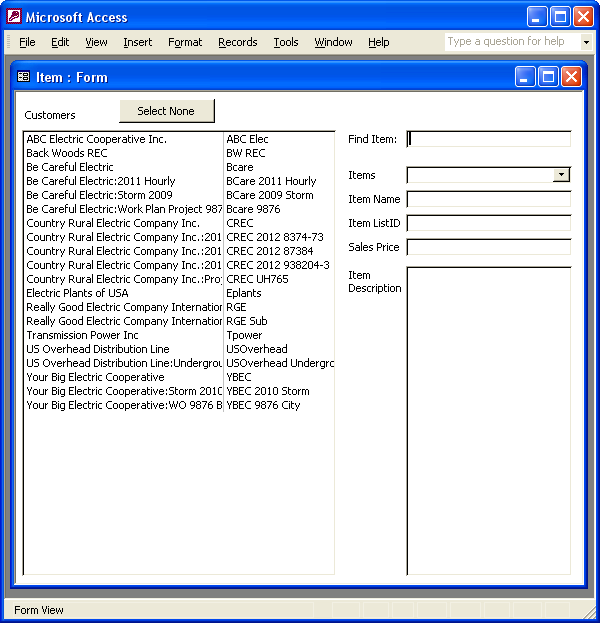 Uses QODBC to import the Customer table from QuickBooks® and put it into a Microsoft® Access Table. This is a reference table that may be refreshed so do not alter or edit this table. 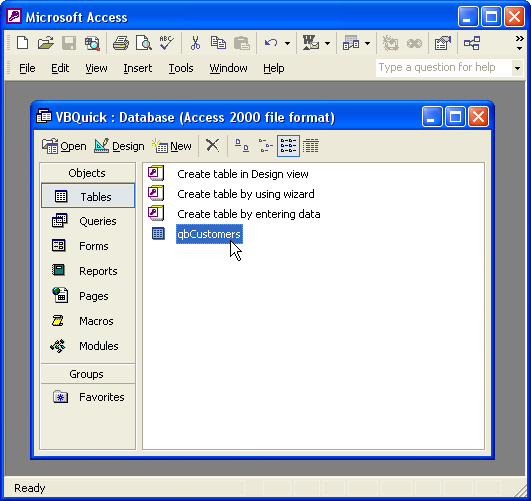 The customer table from QuickBooks® may be linked to any number of tables in Microsoft® Access to extend your customer information database. 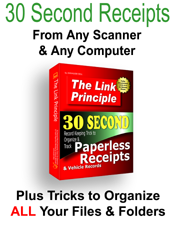 keep more information for customers in your database than QuickBooks® accomodates. For example, personal information, birthdays, anniversaries, family members, hobbies, etc. to access when calling customers for a personal touch. 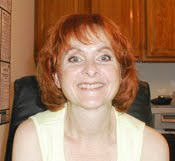 The customer table is really the jobs table for contractors or other QuickBooks® users who add jobs to customers. Every job will be listed in the customer table. To list only customers, use a query that limits Sublevels to 0 something like the query below. Instead of using the customer table, you would then use this SQL or a saved query with this SQL as the recordsource for your form or listbox. ListID is a unique identifier for QuickBooks® tables. Use each customer's ListID as a lookup field in your other database tables. Since this is a function, you can call it from any form. You could use a Refresh Customers button on a form to reload the customer table when new customers are added in QuickBooks or customer information changes. Since the ListIDs will always remain the same, the link will always work as long as you use the Customer table ListID as a lookup field in your database tables. 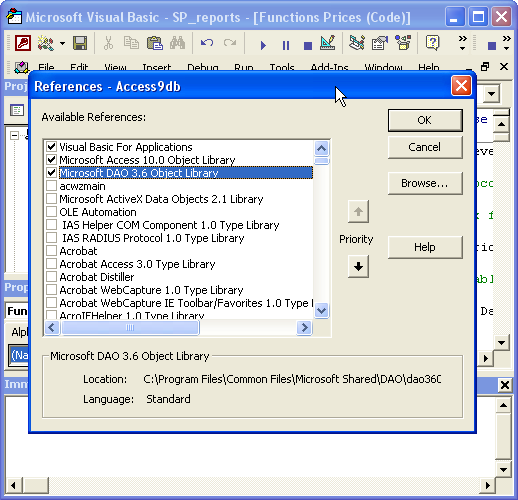 NOTE: If you decide to call this function from multiple forms, you will need a function that closes any OPEN forms using this table or Visual Basic will display an error message that the table cannot be deleted because it is in use. If you only call this function from one form that uses this table as a recordsource (including controls), you must set any recordsources using this table to "" before calling the function and then set them back after the table is refreshed. You may wish to place the Reload Customers button on a switchboard that does not use the table as a recordsource and then call a function that closes all open forms, reloads the customer table, and then opens the closed forms back up. Copy this code and paste it into a module in the Visual Basic Editor. 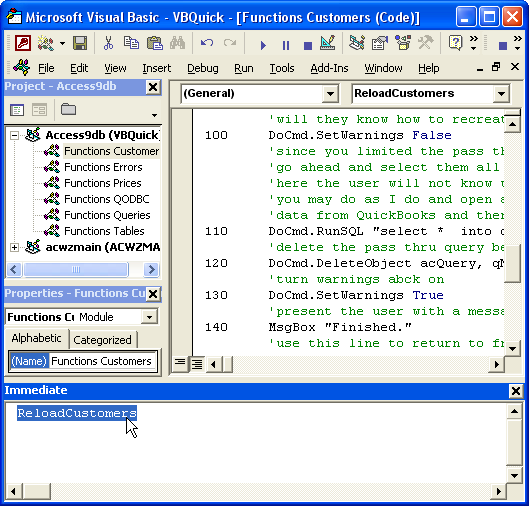 80 qDef.sql = "select * from Customer"
You may already have these in your database if you have used other codes from VBQuick or The Generic Database. If you do not have them, you need to put them into a Module. The above code will not work without them. You need only copy and paste them. Each page provides a link to the code tutorial if you want to understand what they do and how they do it. Then move back to the Database Window to see the new table: qbCustomers. Using a prefix to denote QuickBooks® tables helps avoid overwriting or deleting permanent tables that you create in Microsoft® Access. This code uses the prefix qb but you may change that in the code to anything you like. Remember to be consistent. Choose one prefix that you will use for tables imported from QuickBooks® that you will continually overwrite. You may use a prefix like temp, tmp, QODBC, etc. Customers and Jobs or Just Customers? 80 qDef.sql = "SELECT * FROM Customer where sublevel=0"
The asterisk includes all the customer fields in the query. To further speed up the QODBC query, you may select only the fields you require in your database.